A real-deal collectible from yesteryear. Own a piece of history! This particular Sign is a reminder of the political nuclear arms saber rattling and military tension after WWII between the Western Bloc and powers in the Eastern Bloc. Made for the U.S. Department of Defense during the Cold War. Recall this Fallout Shelter Sign from yesteryear. It was usually placed by authorities in pre-determined fortified buildings, subways, tunnels, bomb shelters, and other areas that would serve as public protection / survival in case of a nuclear attack. You can almost feel the tension and fear of a possible nuclear armageddon when you look at it! Now jazz up your man cave or hideout with this Real McCoy. Not a chintzy imitation by any means. Get this rare collectible from yesteryear. Place your order today! 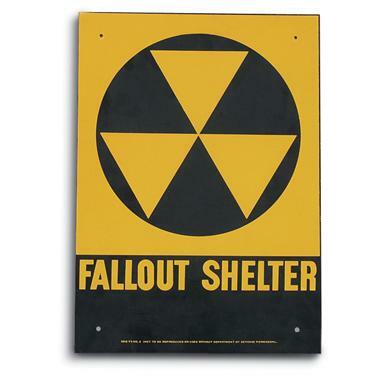 U.S. Civil Defense Surplus Fallout Shelter Steel Sign, New is rated 4.7 out of 5 by 102. Rated 5 out of 5 by hoot101 from New sings The two I received are new condition and the real deal just like the one I requisitioned about 25 years ago. Back in the 60's & 70's these signs were everywhere any place with a large basement. Nice piece of history I wish they were a little cheaper. Rated 5 out of 5 by Kris from Steel - History - Great Nice sign. It does bring back memories. We may need these things again. Rated 5 out of 5 by Diehard from Worthy Buy Nice sign. Solid, the stencil is well done with good quality paint, this is the real deal and not some cheap knock off. A tad pricey imo for a historical novelty with no (immediate) practical use unless you have a fallout shelter but it's a good splurge for décor. Rated 5 out of 5 by USN ET2 from I got it in Mint Condition The sign I received was well packaged and arrived in mint condition, perfect finish and no rust on the galvanized rear.Museum Quality!